When The Window Film Company asked me if I'd like to trial their window film, I jumped at the chance. I'd used window film in our previous house, a Victorian semi detached, and had been super impressed with it. We'd had a side window on the first floor that looked directly on to the neighbours and it was the perfect solution. I'd also had a custom film made for the front porch of my house - the door number had been cut into the sheet and it looked brilliant above the door, a great alternative to the normal plaque choice and far more contemporary. Friends were always commenting on how simple yet effective it was. In our current home, I have a dressing room that overlooks the road so it was the perfect opportunity to see if there was a film that suited the space. The Window Film Company have been at the forefront of the window film industry since they were founded in 1998. The Head Office is based in Chesham, Buckinghamshire and all printing is done on site on their UV and solvent based printers. They've also got a showroom in the Clerkenwell design district and another office at the Fort Dunlop complex in Birmingham. They provide solutions for both residential and business, and they have a graphics team based at the HQ who create custom products to bring your ideas to life. Because they're all on site, it means that turnaround is quick and you can expect super service which is always really important to me when I'm ordering a product for my home. Excitingly, I discovered when I looked at their website to choose a product that they've collaborated with designers to produce some really contemporary and cool designs. This includes brands and creatives such as Mini Moderns, Kate Farley, JoJo Coco Design, Hannah Nunn, Charlene Mullen, Layla Faye, Jane Foster and MissPrint. I picked a Terrazzo design by Lindsey Lang, who trained as a fine artist in textile design and is an illustrator and graphic designer. She draws inspiration from patterns found in nature and I decided that this design would be perfect for the room. It arrived the day after ordering and was cut to my specification - eight panels to fit the bottom part of a large Georgian sash window. It was easy to apply - I simply unpeeled the top of the sheet, attached it to the top of the pane and then pulled the backing down, flattening it as I went with the plastic card that came with the film. It was really quick and the effect was immediate - it looked brilliant. There were several reasons why I decided to test the window film in this room. The first one was the simplicity of the look. My home has original Georgian windows and the surrounds are one of the best features of our house. I don't have any curtains in my home for this very reason. I run regular workshops based on Styling Your Home and one of the first things I suggest when restyling a room is to make the most of what the house has to offer you. Therefore, window film is perfect as it doesn't detract from the beauty of the window frame. Secondly, when planning a dressing room, privacy is a key factor. The window film means that the bottom half of the window blocks out of the outside view of the room, whilst the upper half of the window remains clear. And finally, you don't need to worry about blocking out the light. The window film allows maximum natural light in at all times whilst the Terrazzo pattern blends beautifully with the interior of the room. All of these points encouraged me to give the Terrazzo product a go in my room. 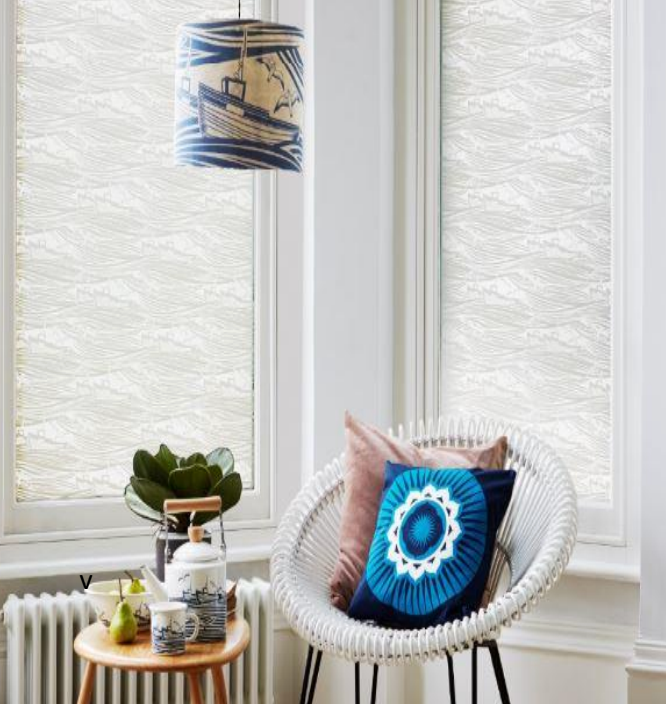 But else does window film offer that standard window coverings, such as curtains, blinds and shutters, don't? Certain rooms, in particular conservatories, can become uncomfortably hot from direct sunlight during the summer months. The Window Film Company have a range of solar control films that can keep it temperate when the weather is warm. In our previous home, we've had concertina blinds which are very effective against the sun but also completely block out the light. You can use safety or security film to help prevent glass breakage which can be really dangerous if you've got young children or pets, for example. I have three children who over the years have been prone to walking into patio doors so I'm hugely pro this one! Sunlight can cause real damage to furniture and flooring. I've found this in my own home (my red leather sofa is now tones of almost orange) and it's always so annoying when you've spent money on buying something you really love and the colour fades. The Window Film Company can provide and install a specialist film to combat this. There's an online store which is super easy to use. You enter your measurements, choose your film and then they deliver straight to you. If you're not confident about doing it yourself or it's a particularly large area, you can arrange for one of their installers to do it for you. The selection is huge, from coloured film to frosted to patterns such as chevron or spots and I must admit, it took a while to make my choice! I'm super happy with what I've done in my dressing room. The window film looks cool and contemporary and does a brilliant job of maintaining privacy but also keeping the area light and bright. Right, where can I try it out next? This sponsored post was in conjunction with the lovely people at The Window Film Company. I would never consider promoting a brand that I didn't love and wouldn't use myself.